Everyone is thinking about flowers this time of year and I'm no exception. 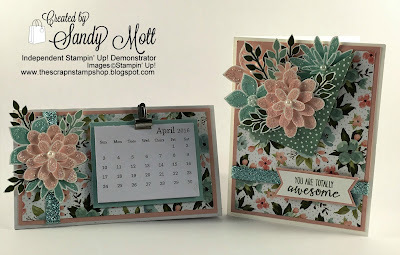 Spring is my favorite time of the year and one can never have too many cards with beautiful flowers. 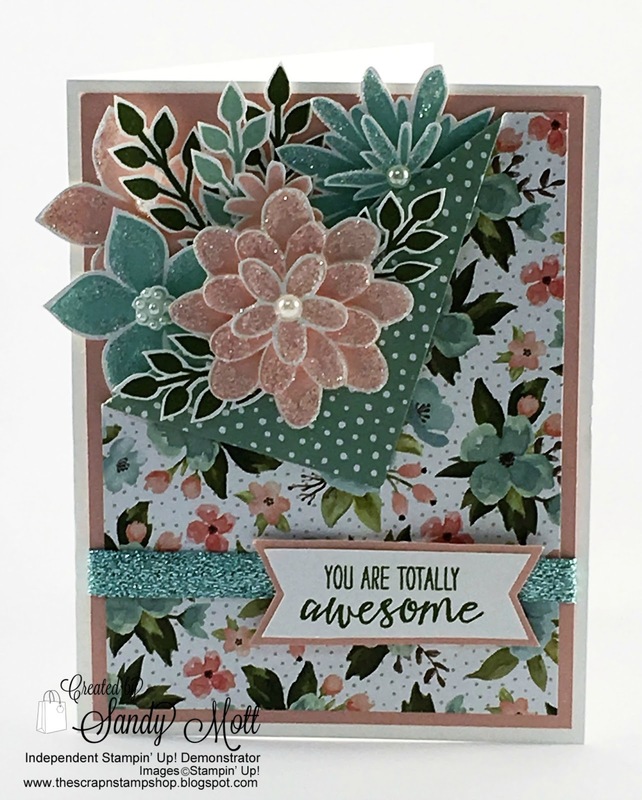 This card was stamped with the Flower Patch stamp set in Blushing Bride and Pool Party. The leaves were stamped in Mossy Meadow and Mint Macaron. 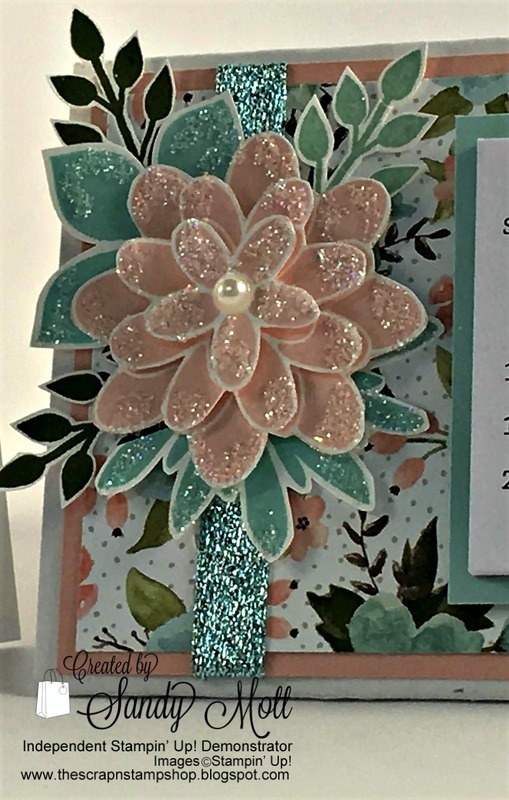 The printed paper is from the Birthday Bouquet Designer Series Paper pack. I adhered a small piece of the Mint Macaron dotted paper to the backside of the floral paper and folded it down. It's attached with a small glue dot. A very nice thank you for someone special. 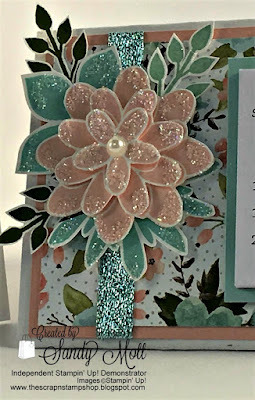 Measurements for the card are as follows: Whisper White Thick - 5 1/2" x 8 1/2", scored in half on the 8 1/2" side at 4 1/4"; Blushing Bride - 4" x 5 1/4"; Floral paper - 3 3/4" x 5", with dotted paper of the same size adhered to the back of the floral paper. Fold down the corner and adhere with a glue dot. Wrap a 5" piece of Pool Party Glimmer Ribbon around the Blushing Bride cardstock before adhering to the card base. Insert flowers that have been sprinkled with Dazzling Diamonds glitter. 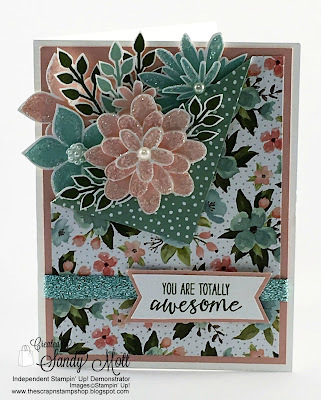 The sentiment is from the "Grateful Bunch" stamp set and was punched with the Banner Triple Punch. 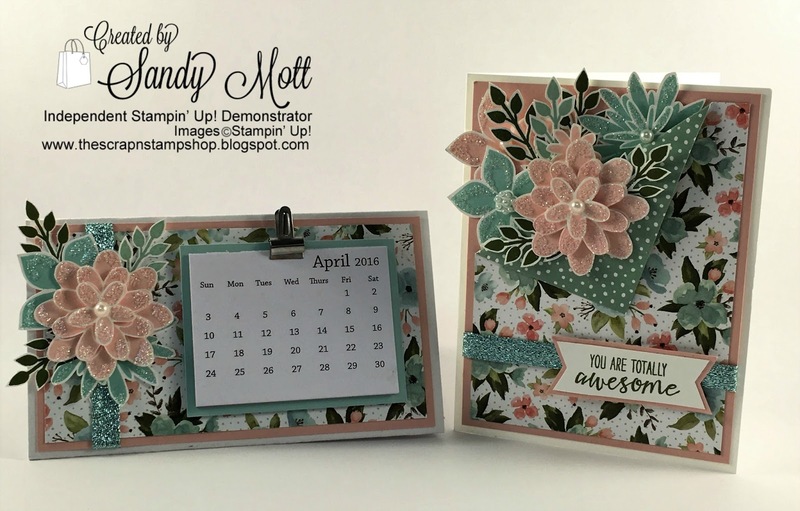 It is backed with Blushing Bride cardstock. Easy-peasy. I also made a simple desktop style calendar - it's very easy to make. 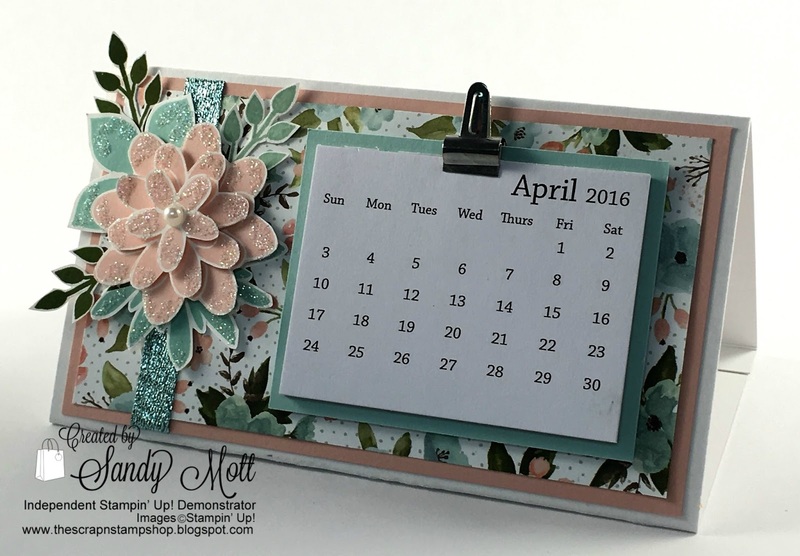 I believe the original pattern for this calendar came from Stamping School some years ago. I used a piece of the cardboard backing that comes with the Designer Series Paper. It is lightweight, sturdy enough, and certainly economical. Cut a piece 6" x 11" and score at 1/2", 4", and 7 1/2". Fold on the score lines and adhere to form a triangle. The 1/2" fold should go under the bottom of the triangle, but I left it on top so you could see in the picture how it goes together. That's it! Then have fun decorating! And here's the completed project! 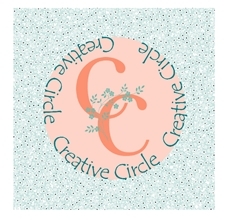 Stay tuned for the Creative Inking Blog Hop on April 20 - I am featuring Flower Patch again with a slightly different color palette and it includes a Wall Hanging. 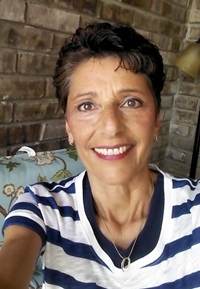 Hope you enjoyed today's post and I would love to hear from you. Love the card and calendar! Where do you get the little calendars?